Associate professor to promote educational opportunity for students at all levels​. ​Dr. Bianco, an associate professor at the University of Colorado Denver who works to pave the way for students of color to become future teachers has been named the University of Colorado’s Timmerhaus Teaching Ambassador. 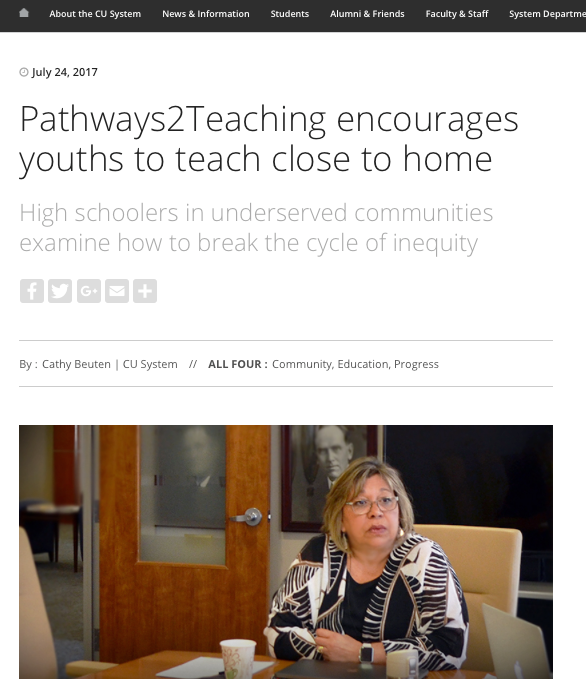 ​The University of Colorado System is proud to announce an exciting opportunity for urban and rural K-12 schools, universities and non-profits in Colorado and nationwide. As the Timmerhaus Ambassador, Dr. Bianco seeks to engage a variety of audiences to discuss the importance of a diversified and community-based teacher workforce. Drawing from her own personal experience as a first generation college graduate, and professional experiences as a classroom teacher, Dr. Bianco developed Pathways2Teaching, a nationally recognized Grow Your Own diverse teacher program designed to encourage high school students in urban and rural communities to become teachers in and for their own communities. ​Are you interested in requesting a presentation or workshop on teacher diversity for your school or organization? Dr. Margarita Bianco is looking forward to engaging audiences on a lecture tour over the next two years. Her Timmerhaus Teaching Ambassador role supports her ability to provide lectures/workshops for organizations that are selected to participate in the tour. When possible, Dr. Bianco brings current or former Pathways2Teaching students with her as co-presenters.